Stream: March For Science A Dud. I am pleased to report the asinine March “for” “Science” has been a dud. Organizers lit the fuse of what they thought was going to be an enormous stick of dynamite. Wait until you hear the boom, honey! But what they got was tiny pop from a damp ladyfinger. The insufferable and ever-smug Vox began its “explanation” of the March with a picture of a kid, maybe eight or so, holding the sign, “Climate change is real”. She’s right, you know. Given global-warming-of-doom has failed to materialize as predicted (over and over and over again), very few snowflakes are being melted. Who knew? I mean, who knew scientists were so smart? Time magazine kindly supplied a video of high-pitched, ear-grating woo-wooing protesters (I still say the DOD was wrong to reject my proposal to weaponize the female protester voice). 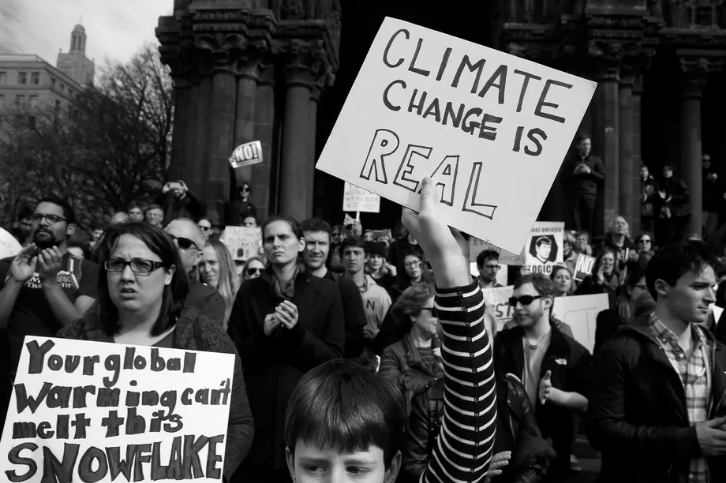 One guy held the sign, “Climate change cannot be undone by tweeting.” But it can be by holding up an idiotic sign? In one of the satellite marches in Los Angeles, a good handful of people showed up, one carrying the sign, “Make wind, not warming.” Flatulence jokes in a science march? Where’s the respect? Australia. “I create knowledge. What’s your superpower”. Sarcasm. Science wants you—no: Science demands—you click over and read the rest. You don’t want to an anti-Science, do you? More than one person had a sign or that read “Science is not a liberal conspiracy.” Yeah? What would make people think it was? Maybe all those liberal political signs? Like the one with a picture of Hillary which read, “She probably would have blinded me with Science.” No, that would have been the bursts of EM from the atomic bombs. Science does not yet have an explanation why this lady has so many teeth. Tweet: “That millions feel they must march to show solidarity with the truth, reason and evidence is not particularly reassuring.” No, it isn’t. How could these marchers have been so easily fooled? An ugly woman with, “My science prevents STDs when grabbing p***y”. Chastity does even better. Heard often: “What do we want? Evidence-based results! When do we want it? After peer review.” Oh, Lord. Peer review. The best guarantor of conformity and groupthink. And this march proves it. Sign (and not the only one): “No science no beer.” Dude? Science is not responsible for beer. Nye angry. Nye no like people not love science. Arrugah! Will somebody get this man a cookie? Number of people holding up that idiotic, scidolatry Neil DeGrasse Tyson slogan can’t be counted. Truly, Science is a religion. What else accounts for all this kiddies? Here’s some real science for you. Note the Hulk. Or note this one, complete with “Black Lives Matter” science poster. Or something. This: “There are people who think “science” is a singular textbook of facts one can reference, like a secular Bible but unquestionably proven.” Like Tyson and his sycophantic followers. Not strictly part of the March, but an indication that “Science” is liberal conspiracy (see above): Science Professor calls for ‘Queer Theory’ teaching in elementary schools. Science leads to vaccines, cars, airplanes, satellites, and computers. Primitive religious superstition leads to marching. Okay, first, I’m embarrassed by the “South Bend, IN” photo. I went to college there (more or less), and would like more sense to come out of the area. Second, are there really people who don’t understand that scientists respond to incentives? I kid, of course – if the incentives led scientists to produce results that didn’t support these folks’ favored policies, they’d understand it just fine. Ladyfingers: 1/2 inch long, very low power firecrackers. Yeah! You must be so pleased! Actual examples would advance your campaign marvelously well. But be aware that “gutting environmental protections” is not the same thing as “modifying political programs.” Nor are State actions under the thumb of Federal government. Not yet, centralist dreams to the contrary. (And I never thought I would see the phrase “economic reality” used by a Man of the Left! Surely, the parousia cannot be far off. YOS, it’s not my fault you pay no attention to the world around you. Try Google. And the federal government can most certainly regulate interstate affairs. Water and air and flora and fauna do not care about political lines written on a map. This isn’t about “centralism.” I know you think philosophy is everything, but again, to the water and the air and the plants and the animals, it is just the BS that it is. Either way, as a matter of constitutional law or just good, ethical, civic-minded thinking, gutting environmental regulations, pretending we are going to bring back some glorious mythical past of King Coal, removing the word “Science” from the mission state of the EPA, state legislatures trying again to sneak in “alternative” theories of evolution – none of these things are good or right. It is sleaze and those who think they’re good ideas are being fooled, or are scoundrels. The EPA did a fine job of that itself starting almost from day one when it banned DDT despite the science; jut to show they could. It has increasingly run amok. The marching yesterday should have been named the March On Science. It was nothing but politicization. Read #18 about how the EPA ignored its own examination hearing results. DDT? Really? Are you really that fringe? Just remember, the EPA has a Rachael Carson room to honor the author of the book, Silent Spring. The book is full of lies. The EPA likes liars. What’s really funny is the clinging to the lie behind that statement. Again, which alternative theories of evolution are which states trying to “sneak” in? By what sneaky legislative methods? A March For Science – good stuff! We engineers approve of “a branch of knowledge or study dealing with a body of facts or truths systematically arranged and showing the operation of general laws” and we should be pleased that people are “for” it. Much better than if they were agin. However, having seen some of the facts and evidence about the marchers, I do wonder what they think (feel?) “Science” actually is, and why they feel they need to march for it? It would be interesting to ask. Any takers? YOS, you are sophistry anthropomorphized. And the EPA does not exist to make you a profit. It’s exists to protect the environment. If it was profitable inside the private sector to keep the environment clean, we wouldn’t need an EPA. You need SCIENCE to figure out how best do do that, not self-serving sophistry. As for carbon dioxide, the weirdly high levels in the atmosphere that are clearly accumulating in the atmosphere and clearly from certain human activities is of great concern to many scientists, and many others. Ignoring it, or pretending it is not “science,” is just a typical sleazy con dodge. Neutral selection. Sexual selection. Natural genetic engineering. Hey. There are at least four or five theories of quantum mechanics, and biology is a lot fuzzier than the hard sciences. And the EPA does not exist to make you a profit. No one said anything about profit. Only about economic and technological feasibility. Requiring something be done that simply cannot be done does not “protect the environment.” It is only virtue-signaling. It indicates that the signaler presents as a morally superior individual and the little people [e.g., engineers] will have to figure out how to do these things. Germany decided it would get its power from “renewable sources” like wind and solar. Oops. As I’ve said before;… “science” needs a real definition. Presently, the Jerksey Mc Jones lot proclaim that “science” is anything that suits their ideology. The irrational Rationalism that does not include certain premises is fundamental to irrational (but popular) “conclusions”. The intellectual perverts who purvey this stuff call it an academically compelling “paraconsistent logic”; which really means that it is a rationalisation based on irrational assumptions. Mssrs W’m Briggs and YOS, see if you can get your “big gun” out of its academic Ivory Tower and onto the battlefield. looking at the replies and the tweets, I can infer that 99% of the tweeters and 20% of the commenters (commentors?) know nothing about how science is done, the history of science or (and this is not an oxymoron) the philosophy of science. Well, Bob, even if it is not a kind of oxymoron it is a kind of redundancy. Long before someone invented the term “philo-sophy” the study of reality was called “physics”. I don’t know where the term “science” came from, but I bet that YOS will have a possible rationalisation. “Science” came from the Latin scientia, which meant “knowledge.” It is equivalent to the Greek word ???????? (episteme). It entered English in the 14th century, or is first attested at that time. It contrasts with ???? (doxa, belief or popular opinion). Hence, “political science,” “military science,” “natural science,” et al. “Philosophy” is Greek and entered English earlier and is known from 1300. It includes not just knowledge but also understanding and wisdom. Scientia meant more than knowledge in the way that I know my phone number or I know my cousins. It means a systematic and rationally ordered knowledge of a subject. Starting ca. 1725. “science” began to contract to mean only “natural science,” although the terms “political science” and “military science” persist in college curricula, as well as in the German term Wissenschaft (knowledge-ship). But knowledgeship raises the question of what is knowledge, and that’s where the division between physics, mathematics, and metaphysics comes into play. Physics dealt with the abstracted properties of physical bodies; mathematics, with the second abstraction – of ideal bodies; metaphysics with being or existence as such. The physics proceeded inductively from experience; mathematics, deductively from first principles; metaphysics, deductively from experience.